Upcoming Trips . . .
Who are Jerry & the Skychasers? Skychasers is a trekking and adventure outfitter specializing in journeys to the High Himalaya of Nepal. 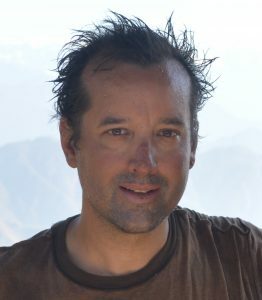 Former Kathmandu resident and Nepal junkie, Jerry Lapp, founded Skychasers as a means of introducing others to this exotic region, known for its mountains, underrated for its colorful culture/religion, and overachieving with its hospitable people. In his own words . . .
I’ve been living in or traveling to the Nepal Himalaya for the past 17 years, and over time it’s become a major life-giving force for me. Every visit gives me renewed energy, confidence in myself and humanity, clarity of mind, and a focus on the things that are truly important in life. One day on trek can instantly reorder priorities to where they should be. Jerry & the Skychasers’ mission is to transition from keeping all of this for himself to bottling and sharing it with you as well. Don’t worry, every tour will have plenty of mountains – that’s a given – but there’s so much more out there that can only be experienced through time and exploration. Rest assured that we have done your homework for you so you can relax and immediately plunge into all the Himalaya and its people have to offer. 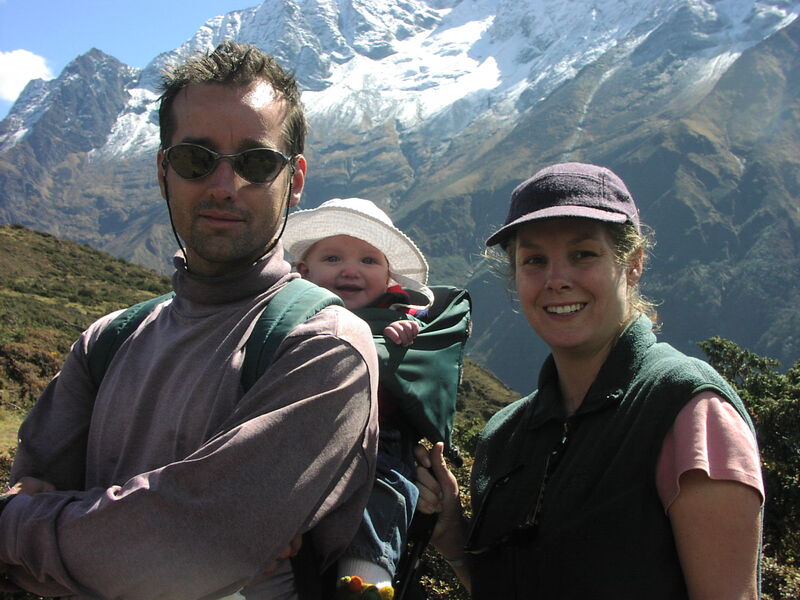 Our goal with this kind of insider experience is to make you feel like you’re leaving home when you leave Nepal. Jerry brings his energy and experience to design and lead each and every tour. 1998 Road trip across Canada with the new girlfriend . . . we’re still together! Jerry lives with his wife, Mary Ellen, and kids Anabelle, Henry and Maisy in Lancaster, Pennsylvania, USA. Over the past eight years, he’s been heavily involved in resettling Bhutanese-Nepali refugees, through volunteering directly with the refugees and serving on the advisory board of CWS, the local resettlement agency. He teaches the occasional Nepali language class to service providers and Nepal travelers. Recently, Jerry and the family have stayed busy with fundraising for Nepal earthquake relief and supporting The Common Wheel, a hometown community bike shop. Jerry loves to use his bicycles for transport, exercise, and mind medicine, and has been known to bribe his suspicious children to be partners in crime on offbeat adventures. 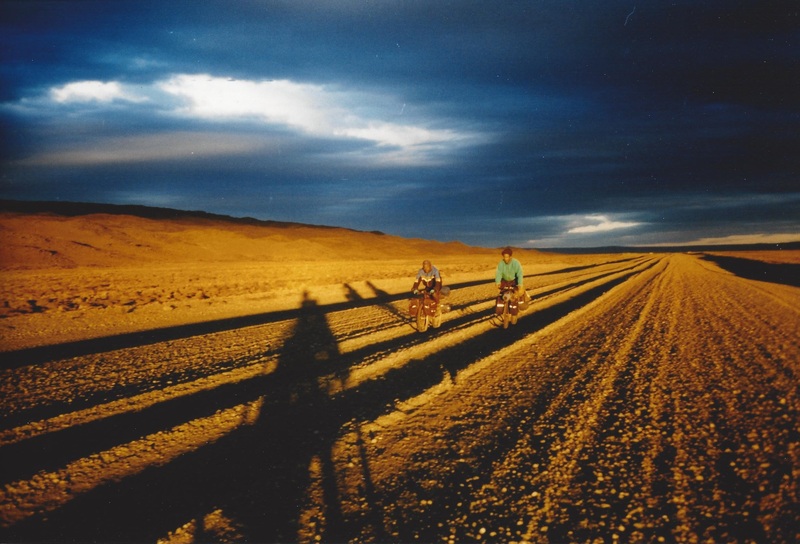 1995, battling wind, sand, sun and 1,000 miles of dirt roads in Patagonia, Argentina & Chile. The upside? No internet, no planning!